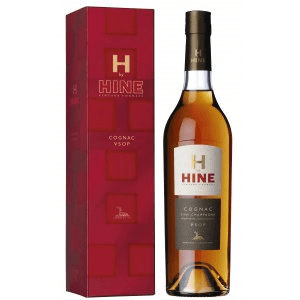 H by HINE vsop Cognac. All over 4 years old. A brandy gift idea. apricot and vanilla . Delicate, original and velvet smooth on the palate. Back in 1550, the Hine family lived in Beaminster, Dorset, on the south coast of England. The family's great cognac journey was to begin in the 18th century: Thomas Hine, the father, a linen merchant and quite a cognac connoisseur decided to send his son Thomas (one of eleven children) to France to learn French and the art of making cognac. Thomas, then aged sixteen, left his family home and headed for France, setting foot in Nantes in 1791, he then travelled to Bordeaux, where he stayed for a while, before continuing to Jarnac, a small town just east of Cognac. Since 1763, Jarnac had been the base for the négociant's premises where Thomas was to create his father's favourite cognac. In the early days, Thomas began his employment as a personal assistant, a respected and worthy position. Not long after his arrival, Thomas Hine made the acquaintance of Elisabeth, the daughter of a famous cognac négiociant and fell in love. In 1796, at the age of 21, Thomas married Elisabeth and they were to have four children.